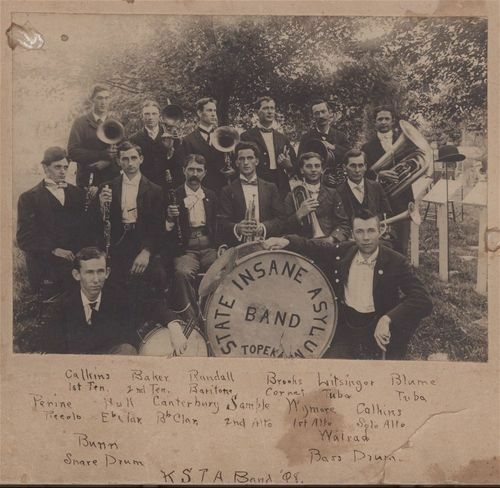 This sepia colored photograph shows members of the State Insane Asylum Band in Topeka, Kansas. The members have been identified by their last name and the instrument they played. The back row: Calkins, first tenor trombone; Baker, second tenor trombone; Randall, baritone; Brooks, cornet; Litsinger, tuba; Blume, tuba. Second row: Perine, piccolo; Hull,clarinet; Canterburg, clarinet; Sample, second alto trombone; Mymore, first alto trombone; Calkins, solo alto trombone. First row: Bumm, snare drum; Walrad, bass drum.